OOZE! 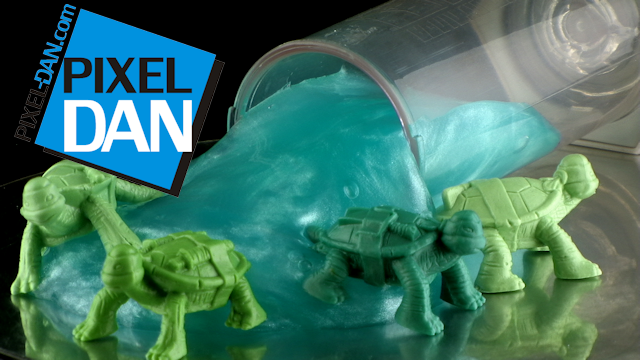 MUTAGEN OOZE! A TMNT line could not be complete without it! Join me for a look at the newest version of this Ninja Turtle toy line staple! Power-Con: Exclusive art prints for advanced ticket holders! Great video dude, can't wait to get these!!! Love slime toys.Makes me wish Mattel had made some slime for the Ghostbusters figures. Dan, Just so you know, on the bottom of the canisters is a numbers stamped. And the numbers either end with a,b,c, or d…..each one pertains to a different turtle. So getting all 4 isn't hard at all. Oh, nice! I didn't see this! Thanks! The best part of this review is the sentence, "Now, I don't blame the slime for this…"
You mean shown the slime in action on the vintage TMNT figures? Yeah, I guess I should have. Sorry! Picked up some Ooze tonight and completely forgot your warning about the taste. It's the unmistakable taste of bitterant, the same stuff that canned air manufacturers added to deter people from huffing it. From what I understand, many have dumped it because it gets all over a keyboard and spreads to the user's hands, which spread it to whatever they touch (or eat with their hands) and takes hours, sometimes days, to go away. It's made to be unwashable so as to provide a continuing deterrent for abusers. I'd heard that some toymakers were adding it to their similar toys to keep kids from eating it, but I figured manufacturers like Playmates would be bright enough to change it up enough so that it wouldn't be so persistent. Looks like I was wrong. Let's just say that it's now 9 hours after putting the slime back into its tube and washing and I still can't eat anything with my hands. Kind of upset that I spent so much money on something that I can never use again.